In case you haven't heard, there are unicorns and rainbows on the southwest corner of Adobe and Washington in Petaluma. Where residential morphs into rural sits a field covered in flashy polychromatic blooms, flanked on one side by a row of weathered barns. Welcome to Aztec Dahlias. On this acre of neatly planted rows, 5,200 dahlias representing an impressive 400 varieties compose a living art gallery, an homage to the greatest artist of all time: Mother Nature. If you've never seen one, the dahlia is no ordinary flower. This extraordinary flower ranges from colossal, 10-inch-diameter "dinner plates" to dainty two-inch pompons. With more tightly packed petals than the eye can comprehend and varietal names like Brittney Ray, Thomas Edison and Gay Princess, dahlias grow in the most fantastical colors from deep orange with a flash of fuchsia to highlighter yellow to the darkest red you've ever seen. Dahlias were originally grown for their edible tubers by the indigenous people of Mexico until they began to be cultivated for their flowers in the late 1700s. In 1917, the first dahlia society in San Francisco was founded, and in 1926 the dahlia was chosen to be the official flower of the city of San Francisco. Thirty-seven years later, the stunning perennial was also selected as the national flower of Mexico. But rather than a lengthy description of some incredible flowers, this is the story of a wild and wonderful dream come true. A few years back, Freestone resident Kate Rowe spotted a lone potted dahlia plant for sale at the Friday night Occidental Farmers Market. The plant had just one ball-shaped bloom, yellow in the center, with raspberry-colored petals. A stranger to dahlias, Rowe describes being "completely smitten" upon seeing it, and then laughs, recalling that she had also met her longtime partner, Omar Duran, at the same market. She didn't buy the plant that week, but the next week, when she went back, it was there again, still for sale. Rowe bought and planted her first dahlia that year, multiplying to three the next year, then 11, then 22. "That's when I knew I had a problem," she says. At the time, she was working nearly 100-hour weeks as an event producer and software product manager. The dahlias were her healer. "The flowers made me present when I was completely and utterly distracted, so caught up with things that were really not important to me in life, though I thought they should be. All of a sudden, I would be around one of these flowers, and, even just for a moment, I was completely taken and totally present." She was inspired to bring that same feeling to others. At the height of her home garden, she was growing 120 dahlias and had begun thinking about making it a business and dreaming about making it her life. And that's when sweet serendipity began making appearances. In the midst of having these thoughts, Rowe received a phone call from a woman she had met at a party who was studying to be a life coach. She had finished her training and wanted to offer free coaching hours. Through these unexpected sessions, Rowe realized that following her dream was actually possible. No sooner had she begun visualizing the possibility than she ended up having a fateful conversation that changed her life. While she was getting a haircut, engaging in some friendly salon banter, she mentioned her dream of one day becoming a dahlia farmer. "No kidding?" her hairstylist replied. "You want to be a dahlia farmer? 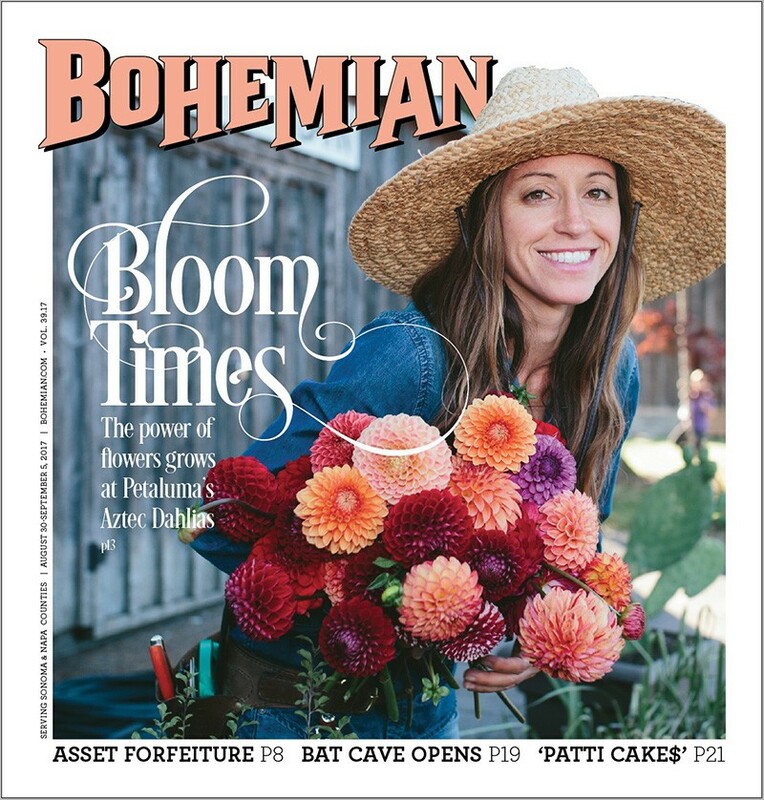 Well, I know someone who has a dahlia farm in Petaluma and is thinking of selling it." Turns out that Jamie and Rosa O'Brien, who had owned Aztec Dahlias for more than 15 years, had just started thinking about moving to Texas to open a restaurant. They had only discussed it with their immediate family, not publicly, but the O'Briens' daughter happened to go the same hairdresser as Rowe. Rowe's hairstylist put her in touch with Jamie O'Brien, who welcomed the idea, saying that he and his wife were indeed considering selling, but didn't know who they'd sell to. While they originally had decided to sell in two to three years, a month later, they shifted gears and now wanted to sell as soon as possible. A NEW LEAF Kate Rowe and Omar Duran traded stressful careers for the sweet life of flower growing. Rowe and Duran discussed the idea. He was equally unhappy with his job as a bike builder, so they decide to go for it. Rowe held on to her job temporarily, to keep some steady income, and Duran immediately began shadowing O'Brien full-time to learn the ropes. On Aug. 11, 2016, they were officially proud (and super-freaked-out) owners of a dahlia farm, a dream that was realized so quickly that it was almost hard for them to grasp. But how does one go from tending a hobby garden to being responsible for thousands of flowers and an established business? On the business side, Rowe says every previous position she had held ended up somehow preparing her for this moment, from orchestrating events to being a master of spreadsheets ("The whole field is a spreadsheet!") and number-crunching. On the plant-care side, the answer is two-fold: listening to the plants and tapping the collective wisdom of the vibrant dahlia community. Even though dahlias have a reputation for being difficult to grow, Rowe believes they're not. "We're just present to the plants," she says. "For example, when you're cutting the flowers all day long, if the stem is dry and woody, they need water, and if the stem is soggy, it has too much water. They start to talk to you after a while." She adds that it's helpful that Duran is "the plant and animal whisperer," with a natural knack for knowing what makes them happy. Although Aztec Dahlias is the only dedicated dahlia farm in the area, Rowe gleaned invaluable insight from other California farmers, notably Kristine Albright of Santa Cruz' Blackbird Farms and Kevin Larkin of Corralitos Gardens, who has 40 years of experience growing dahlias and generously spent hours on the phone sharing his wealth of knowledge. The hardest part? Now a full-time farmer, Rowe thinks for a minute and says, "Waking up at 4:30am and working 18-hour days," but she acknowledges that this is only their first full year and her process is becoming more streamlined and efficient all the time. Plus, the overwhelming joy and sense of presence they bring to people makes all the hard work worthwhile, she says. Luckily, only the summer high season is crazy. Normally, tubers are planted in April; Aztec Dahlias' flowers are planted in a greenhouse in February to ensure viable plants. They then get transplanted to the field in May and bloom from June or July to mid-October, going dormant on the first full rain. The tubers are then dug up by hand and sold to clients across the country, usually selling out, especially because Aztec carries so many hard-to-find varieties. 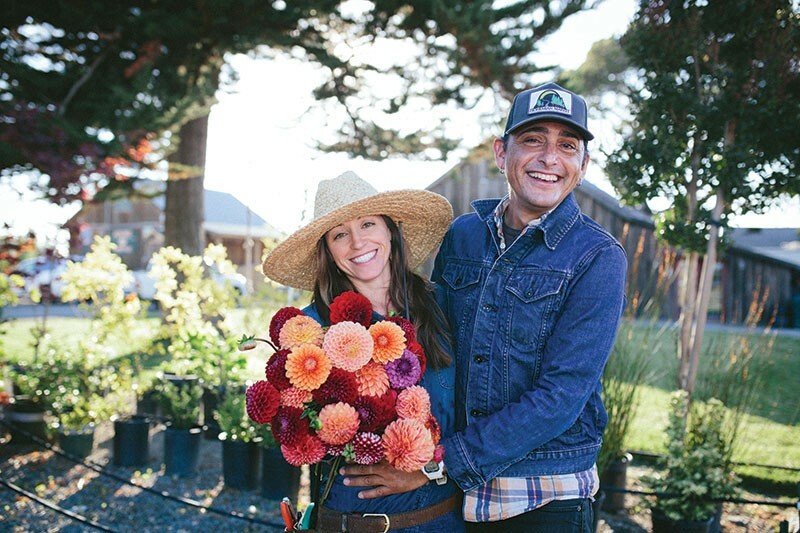 Rowe and Duran sell their flowers at six farmers markets a week, plus at the Sonoma Flower Mart at Sebastopol's Barlow on Wednesdays and Thursdays, as well as every day but Monday at their flower stand at the entrance to the farm, which is the best place to see them. The flowers have a hypnotic effect, drawing a steady stream of dahlia lovers and enticing clientele to get to the markets a full hour before opening to get first pick. They usually sell out, even though they've been averaging 300 flowers for sale at each of the big markets. Our customers "are just obsessed like we are," says Rowe. "I'm definitely obsessed. They're so magical." Rowe and Duran have big plans. Rowe would like to organize an event around the height of the bloom (which is starting now) called Bloombastic, as well as an event around the end of bloom called the Bloomdiggity, where everyone comes and cuts flowers before they dig up the tubers. Aztec Dahlias has also started hosting design workshops and may add watercolor workshops and invite folks to use the space for photo shoots. They have visions of making the farm into an even more inviting space by setting up tables and chairs where folks can bring their own libations and be surrounded by the field. They've intentionally planted their rows with wider aisles in between to encourage folks to walk around. "That's what people love," says Rowe. "They just light up when they're in the field. People come intending to stay 10 minutes and then end up staying hours. I want to create a space where people feel better just being here, to have this sense of awe and wonder. Whatever else is going on in their world, whether an illness in the family or the stress of work, gets left behind. It's all rainbows and unicorns out here."